Learn how to increase instructional rigor so that all students can reach higher levels of learning! In this new edition of a best seller, author Barbara R. Blackburn offers practical ideas for raising expectations, increasing complexity, integrating scaffolding into instruction, creating open-ended choices and projects, and much more. This timely new edition provides connections to rigorous standards, plus it features new sections on topics such as questioning models, student ownership, Genius Hour, summative assessments, becoming a teacher-leader, and increasing rigor in instructional technology. Appropriate for teachers of all grade levels and subject areas, the book is filled with helpful strategies and tools that you can implement immediately. In addition, full-sized templates are available as eResources on our website (www.routledge.com/9781138569560) so you can download and print them for classroom use. 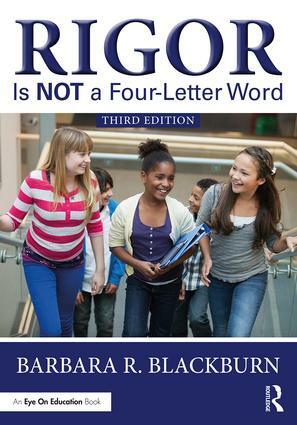 With its practical advice and helpful tools, Rigor Is NOT a Four-Letter Word will set you and your students on the fast track to higher learning and sustained success.